Who are you, General John Abizaid? The Pentagon has appointed a combat general as an adviser to Ukraine who was head of United States Central Command. "Abizaid will give solid advice to Minister Poltorak and other senior Ukrainian officials on the question of reforms designed to bring the ArmedForces of Ukraine into line with Western principles and standards such as strengthening democratic civilian control over the Armed Forces, the fight against corruption, the transition to a NATO-compatible staff structure." It would not be quite right to talk about Abizaid as just the last adviser to be appointed for Poltorak. Because he was officially appointed by no other than the US Secretary of Defense. Of course, he will be Ukraine de jure as an adviser, but de facto as a controlling representative of USDefense Department. Thus, he can be described as an unprecedented appointment, and for several reasons. First, while in the past US advisers were appointed assigned to the sidelines, but now this is being stated at official level. Thus, according to Secretary of Defense Ashton Carter, the appointment of General John Abizaid is a continuation of US defense-oriented military assistance to Ukraine. Second, not just anyone was appointed an adviser but a 4-star US Army general, who passed through all the stages of an army career. He received a good education at the best US Military Academy, he has a convincing track record, having taken part in many military conflicts of the last 30 years, from Grenada to Iraq. Third. Of course, cost control of US aid could be done by a military attache with his service, but the resources of the US Embassy in Ukraine are not limitless. Therefore, the appointment of Abizaid is completely understandable. The retired general with such a rank will facilitate the work of the defense system in general and deal with aid packages, which, according to the "Concept of Development Partnership" will come to $335 million in 2016. Fourth, it is worth understanding that this is not one-off assistance. The US is seriously interested in reforming the Ukrainian Armed Forces. Ashton Carter madeit clear that the US position regarding aggression against Ukraine remains steadfast, annexation of Crimea will never be recognized, and the hybrid war against Ukraine in Donbas will end as ahumiliating defeat for Russia. The Program of the 5-year partnership clearly says that 350 US military trainers will conduct the training of five battalions of the Armed Forces of Ukraine and one Special Operations battalion, and help to develop long-term plan training. And that's not all. Financial aid is intended for the purchase of counter-battery radars, drones, communications, training facilities, logistics infrastructure and IT systems, medical equipment and so on. 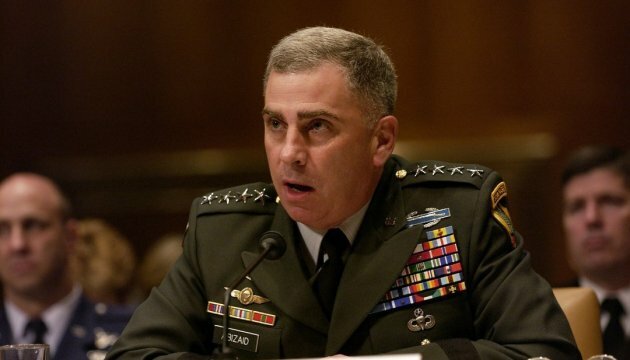 During 34 years of service in the US Army, General John Abizaid managed to take part in military operations in 27 countries, from the Horn of Africa, the Arabian Peninsula and ending in South and Central Asia. But the main reason why the Pentagon chose John Abizaid is that he is still a member of the expert council of the Center for Strategic and International Studies (CSIS), a Washington-based "think tank" that conducts research on policy and strategic analysis on political and economic security around the world. Well, what can you say here, Defense Minister Stepan Poltorak now has a combat general as his adviser.